African Black Soap, 5 oz. African Black Soap, made with Palm Ash, Tamarind Extract and Plantain Peel has been used in Africa for centuries to minimize the appearance of skin blemishes and other skin ailments. Historical references to Shea Butter, a staple of African pharmacology, date back to the reported Shea Butter caravans of Cleopatraâ€™s Egypt. Contains: Coconut Oil : it nourishes, moisturises and lightens your skin tan. Wild Ginger : soothes the skin and helps prevent infections and rashes. Lime Peel Oil : for a refreshing cooling effect and rich, penetrating lather with an astringent action. Hydnocarpus Oil : helps prevent skin problems, rashes and outbreaks. Orange Oil : tightens pores, helps prevent pimples and blackheads. Sandalwood Oil : to cool, refresh and gently prefume your skin. Contains: Coconut Oil, Sodium Hydroxide, Palm Oil, Wax, Soap Stone Powder, Mixed Essence, Cos Oil Green, Water. Eucalyptus Bar Soap, 5 oz. 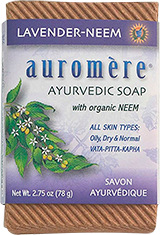 Dr. Bronner"s Magic Soaps are absolutely pure: organic, fair trade, no animal testing! Eucalyptus is invigorating and helps to clear sinuses The soap helps to open the pores of the skin for deep cleansing. All oils and essential oils are certified organic to the National Organic Standards Program. Contains: Organic Coconut Oil*, Organic Palm Oil*, Sodium Hydroxide**, Water, Organic Eucalyptus Oil, Organic Olive Oil*, Organic Hemp Oil, Organic Jojoba Oil, Salt, Citric Acid, Tocopherol. Contains: Coconut oil, palmyra oil, water, alkali, castor oil, hydnocarpus (cactus) oil, rose compound, sesame oil, Indian beech oil, Indian butter (Mashuca indica) oil, damascus rose petals, zedoary, hibiscus, fenugreek, tulsi (holy basil), sandalwood, henna, almond, and vetiver. Lavender Bar Soap, 5 oz. 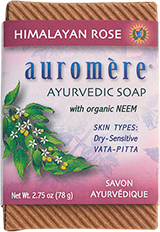 Dr. Bronner"s Magic Soaps are 100% pure! Lavender is one of the most popular essential oils, used in baths since Roman times. It is relaxing and is recommended for those who are nervous or tired. It can be used before retiring for the day or to get a fresh start in the morning, or simply to wash up after doing something outdoors. All oils and essential oils are certified organic to the National Organic Standards Program. Contains: Organic Coconut Oil*, Organic Palm Oil*, Sodium Hydroxide**, Water, Lavandin Extract, Organic Olive Oil*, Organic Hemp Oil, Organic Jojoba Oil, Organic Lavender Oil, Salt, Citric Acid, Tocopherol. 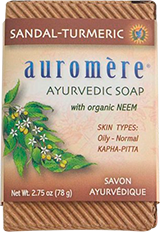 Contains: Coconut oil, palmyra oil, water, alkali, castor oil, Hydnocarpus (cactus) oil, lavender compound, neem oil, sesame oil, Indian butter (Madhuca indica) oil, turmeric, sandalwood, Hibiscus, Bael leaf, Indian soapnut, zedoary, fenugreek, mung bean, indigo and Alangium salvifolium. 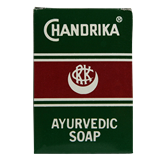 Contains: 100% vegetable soap: butyrospermum parkii (shea butter), coconut oil and/or palm oil, theobroma cocao (cocoa) seed butter, lemongrass oil, tea tree oil, vegetable glycerin, orange peel, tocopherol (vitamin E), orange oil, mineral pigment or vegetable color. Contains: Organic White Grape Juice, Organic Sucrose*, Organic Coconut Oil*, Potassium Hydroxide**, Organic Olive Oil*, Organic Tea Tree Oil, Organic Shikakai Powder, Organic Hemp Oil, Organic Jojoba Oil, Citric Acid, Tocopherol. Peppermint Pure Castile Bar Soap, 5 oz. This soap is scented with organic peppermint oil to cool the skin, clear sinuses and sharpen the mind. This Peppermint Pure-Castile Bar Soap is made with certified fair trade ingredients and organic hemp oil for a soft, smooth lather that won"t dry your skin. 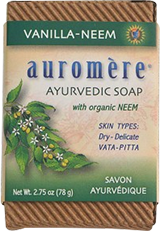 Contains: Organic Coconut Oil (Certified Fair Trade Ingredients), Organic Palm Oil (Certified Fair Trade Ingredients), Sodium Hydroxide (None Remains After Saponifying Oils Into Soap & Glycerin), Water, Organic Olive Oil (Certified Fair Trade Ingredients), Mentha Arvensis, Organic Hemp Oil, Organic Jojoba Oil, Mentha Piperita, Sea Salt, Citric Acid, Tocopherol. Contains: coconut oil, palmyra oil, water, alkali, castor oil, sesame oil, hydnocarpus (cactus) oil, sandalwood oil, neem oil, rice bran oil, indian beech oil, Indian Butter Tree (Madhuca indica) oil, neem bark, dhub grass (Cynodon dactylon), Indian gooseberry (Amla), turmeric, peepal (bodhi tree), celastrus seed, Corallacarpus epigaeus, nutgrass, zedoary, Indian madder root, costus, mung bean and fenugreek. Contains: Organic Coconut Oil*, Organic Palm Oil*, Sodium Hydroxide**, Water, Tea Tree Extract, Organic Olive Oil*, Organic Hemp Oil, Organic Jojoba Oil, Salt, Citric Acid, Tocopherol. Contains: Vegetable Base (Sodium Palmate and Sodium Cocoate / Sodium Palm Kernelate), Purified Water, Vegetable Glycerin, Melaleuca Alternifolia (Tea Tree), Leaf Oil, Citrus Floral Fragrance, Sodium Chloride, Titanium Dioxide, Sodium Gluconate, Iron Oxide. 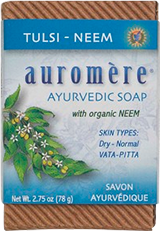 Contains: Coconut oil, palmyra oil, rice bran oil, alkali, water, neem oil, hydnocarpus (cactus oil), castor oil, tulsi (holy basil), rose petals, zedoary, turmeric, fenugreek, psoralea corylifolia (babchi seed), peepal (bodhi tree), alangium salvifolium, costus, Indian sarsaparilla, Shiva neem (a variety of neem), hibiscus. Contains: Coconut oil, palmyra oil, water, alkali, castor oil, Hydnocarpus (cactus) oil, vanilla compound, neem oil, sesame oil, Indian beech oil, Indian gooseberry (amla), sandalwood oil, Hibiscus, henna, vetiver, zedoary, fenugreek, mung bean, indigo and rose petals.